Lunchbox Dad: How to Make a Day at the Beach Lunch! Currently it's winter time, with ice storms possible, and my family lives in Oklahoma. Let's just say that right now we are dreaming of a day at the beach. The last time we visited California we were able to spend some time there and it's one of my kids' favorite places. 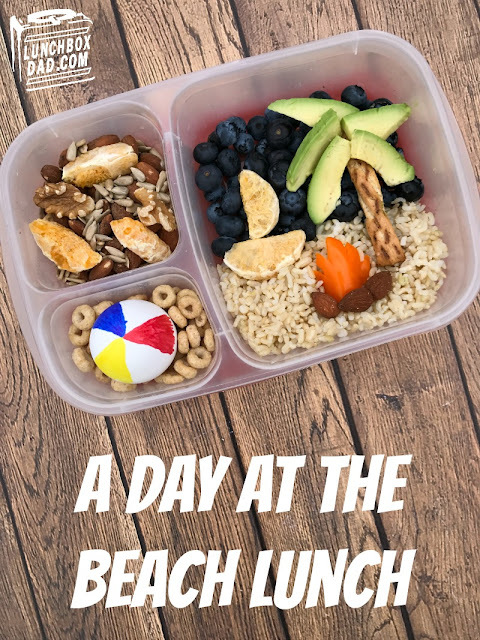 Because my kids needed a little break from winter, I made my children a day at the beach lunch! See how I did it below. We also recently discovered some really great healthy snacks that I was able to incorporate into the lunch. 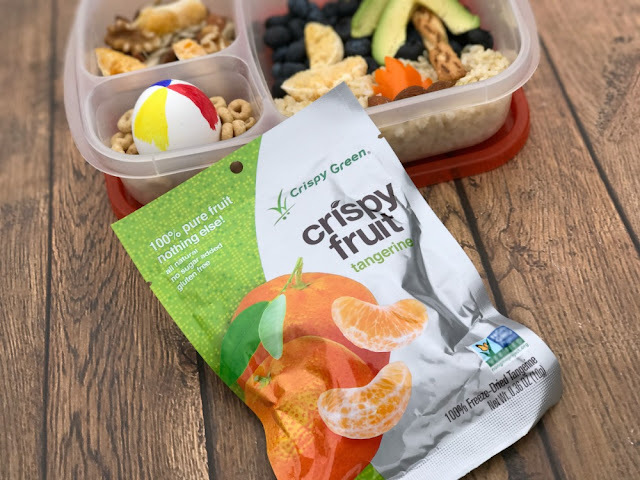 The snacks are from Crispy Green and they are called Crispy Fruit which are freeze dried and 100% pure fruit--no added sugar or preservatives! My son (the picky eater) tried the tangerine sailboat and he described them as, "Sour at first but then they taste like sweet sugar!" Needless to say he ate the rest. I also found out that Crispy Green is one of the sponsors for Power Your Lunchbox Pledge. This program empowers families with tips, ideas, and recipes to make healthy lunchboxes. When you take the Power Your Lunchbox Pledge to eat a healthier lunch, you can get money saving coupons and money will be donated to Feeding America to provide meals to families in need. 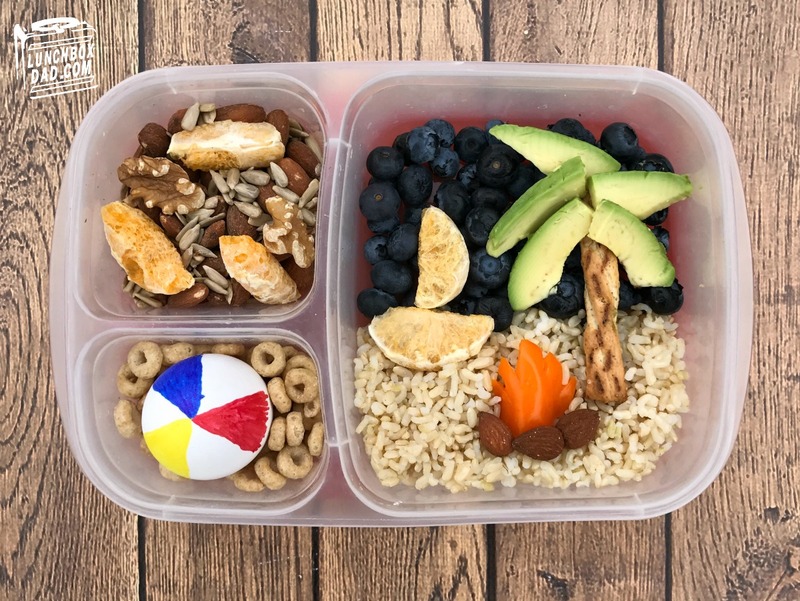 In August 21,674 families and classrooms pledged to eat a healthier lunchbox, helping to provide 238,414 meals for families in need through Feeding America. To take the pledge and help feed families, spend a minute or two and go to the Power Your Lunchbox website now! Ingredients: Crispy Fruit Tangerine pieces, cooked brown rice, orange sweet pepper, pretzel stick, avocado slices, blueberries, round cereal, hard-boiled egg, assorted nuts and seeds. 1. Spoon brown rice into bottom section of main compartment of lunchbox. Fill in the rest of the main compartment with blueberries. Lay pretzel stick and avocado pieces on top of rice and blueberries to create palm tree. Place two pieces of Crispy Fruit Tangerine pieces together on top of blueberries. This makes a fun sailboat! 2. Finish main compartment by cutting a piece of orange sweet pepper into the shape of a bonfire. It is really easy, it just needs some jagged edges. Place on top of rice and put almonds around the bottom. 3. 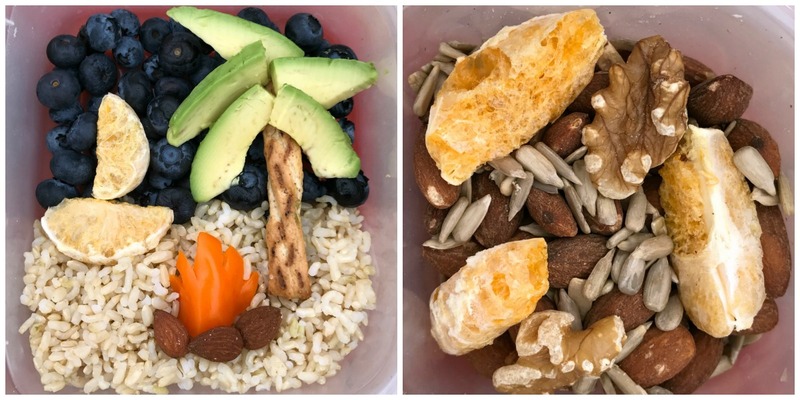 In one side compartment of lunchbox place assorted nuts (almonds, walnuts, sunflower seeds, etc.) together with more Crispy Fruit Tangerines to make a homemade trail mix. Also remember that Crispy Fruit is best when you snack on it right away out of the bag so make sure and eat the rest while you are making the lunch for your kids! 4. Use red, blue, and yellow permanent markers to draw on a hard-boiled egg shell. Create three triangles as shown to make the look of a beach ball. Place in second side compartment and surround with cereal pieces to keep the egg upright. Have fun making your kids a day at the beach lunch and don't forget to take the Power Your Lunchbox Pledge! To find more fun and healthy food ideas go to www.smartlifebites.com and produceforkids.com. You can also find tips for adults and kids on Crispy Green's Facebook page HERE, on Twitter HERE, and on Instagram HERE. You can find Produce for Kids' Facebook HERE, on Twitter HERE, and on Instagram HERE.